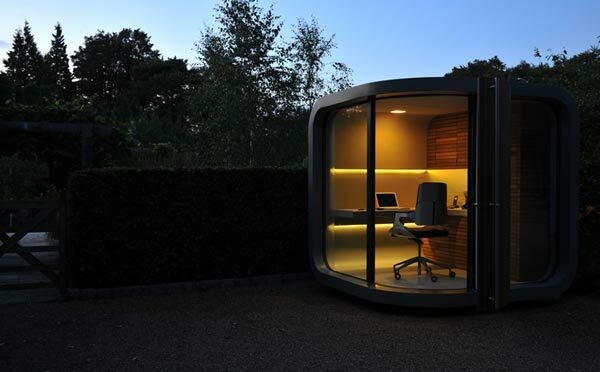 OfficePOD Gives Home Office A WHOLE New Meaning!! 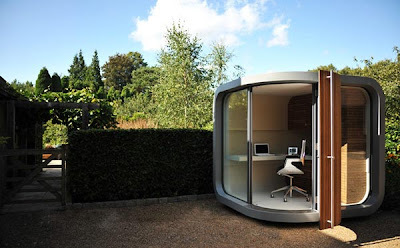 OfficePOD Prefab Home Office | Working from home can be a serious challenge. Kids, pets and housework can put a significant strain on any workflow, so some tele-commuters have opted to divide their work from their home– with a separate office elsewhere on their property. The OfficePOD is a prefab home office unit that provides nearly 7′ x 7′ of office space and storage in a curvy, contemporary package. Plop the OfficePod on your property — be it your back yard or even a separate lot in a woodsy setting — and you’ve got a full-service modern office without the household distractions. 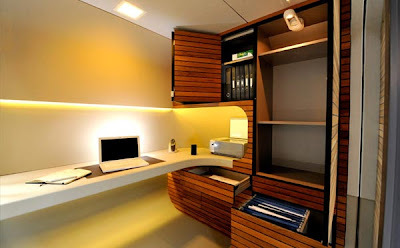 The OfficePOD is powered by a discrete electrical connection to your home, while web and phone connections can either be hard-wired or operated via WiFi. The unit is lit by recessed lighting in its ceiling and with reflected light hidden within the walls. To the right of the desk is a series of attractive, wood-slatted storage options from closeted shelving and large drawers. While pricing wasn’t readily available on the OfficePOD website, we can’t imagine this would carry the same cost as office space within your area. As three-year veterans of the work-from-home lifestyle, we can tell you firmly that the commute cannot be beat. While distractions are numerous, having a separate space has always been a goal of ours. 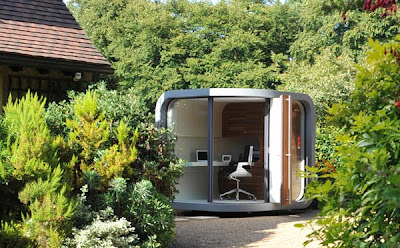 We welcome the concept that OfficePOD brings, and would love to get one of these in our own back yard.